Is swimming with sharks on your bucket list? Do you find yourself imagining what you’d do, looking into the rows and rows of sharp teeth & beady grey eyes, of the ocean's most terrifying predator? 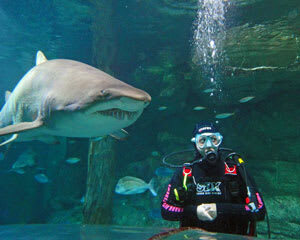 Well look no further, Adrenaline has a myriad of Shark Diving Experiences to select from. So, keep on reading to decide which one is for you. What is it like to swim with sharks? Swimming with sharks is an experience you are unlikely to forget. You’ll glimpse steel-grey eyes and rows of sharp teeth up close and personal when you take the plunge and tick shark diving off your bucket list. If you’re in Melbourne, Adrenaline can offer the perfect package with a thrilling half-hour underwater tour at the Melbourne Aquarium. You’ll view Grey Nurses, Sandbar Whaler Sharks, exotic stingrays and hundreds of other underwater creatures at close range. This package is suitable for certified and non-certified divers and includes an introductory training and pool session before you take the plunge inside the aquarium’s 2.2 million-litre oceanarium. The dive is suitable for absolute beginners to experts and makes a great gift idea for the ultimate adventure-seeker in your life. Brave-hearts need only apply. 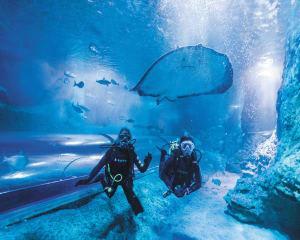 When in Sydney, head to the Sydney Aquarium at Darling Harbour to fulfil your dream of swimming with sharks. The package offered is similar to the Melbourne Aquarium shark swim, but in addition to 4.5-metre-long Grey Nurse Sharks, you’ll also view wobbegongs, Port Jackson sharks, four species of stingray and marine turtles. Family and friends can witness first hand as you conquer your fears from the safety of the spectator tunnel. They’ll be sure to wave and give you the thumbs up, while they capture the memorable moment in photographs. 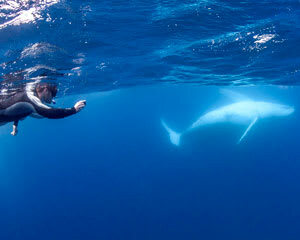 There are also excellent eco tours provided by Adrenaline where you won’t even have to dip your toe in the water. 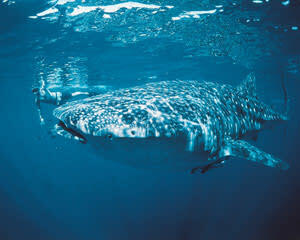 If you’re in Western Australia, for example, you can take part in the Swim with Whale Sharks experience at Ningaloo. Aboard a state-of-the-art vessel, you’ll view up close the majestic wonder of whale sharks on Ningaloo Reef swimming alongside as you recline in the ultimate comfort and safety. A gift voucher for this once-in-a-lifetime experience would make the perfect gift idea. All Adrenaline vouchers are valid for three years. 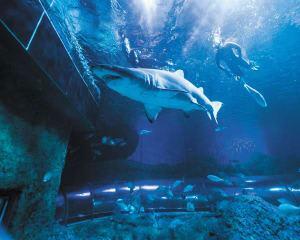 What is it like to go shark-cage diving? 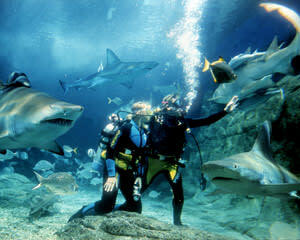 Shark-cage diving is a truly exhilarating experience that you are unlikely to forget and will yearn to relive. Since pioneering shark-cage diving with Great White Shark more than 40 years ago, Rodney Cox Expeditions have educated the public and attracted adventurers from around the world. The Port Lincoln Marina in Adelaide is your departure point, where you’ll be transported in a live-aboard to the clear waters of the Southern Ocean. 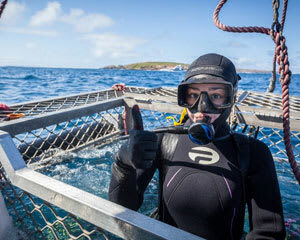 You’ll experience Surface Cage Great White Shark Diving, swim with sea lions at Hopkins Island and embark on a tender boat tour around Neptune Island to view the breathtaking fur-seal community. No diving certification is required and up to 12 people can get on board the Princes II live-aboard as you set sail on this unforgettable marine-life experience. Adrenaline cannot only realise this dream for the adventurous of spirit, but also provide gift vouchers of any denomination for you to give with love and fortitude. How safe is shark diving? Shark-diving experiences, such as those hosted by Rodney Cox Expeditions, are perfectly safe, controlled and expertly organised. The stainless steel surface cage used for shark diving is foolproof, and Cox should know: he invented it more than 40 years ago. He keeps abreast of new technologies and is a passionate eco-educator about the misgivings of the Great White Shark. The expert team guide, encourage and take full control of divers of all experience levels. Tiny air holes provide the breathing mechanism and even though you’ll be centimetres from the awesome Great Whites, you’ll feel fully enclosed, safe and, importantly, separate and untouchable!